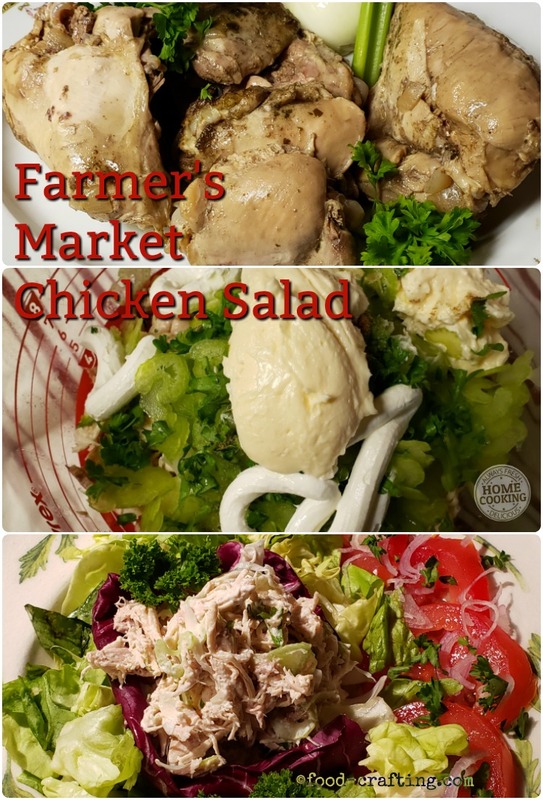 Farmer’s Market Chicken Salad – This recipe dates back to the ’50s if not earlier. My mother in law Margaret had a table at the local Farmer’s Market for years. 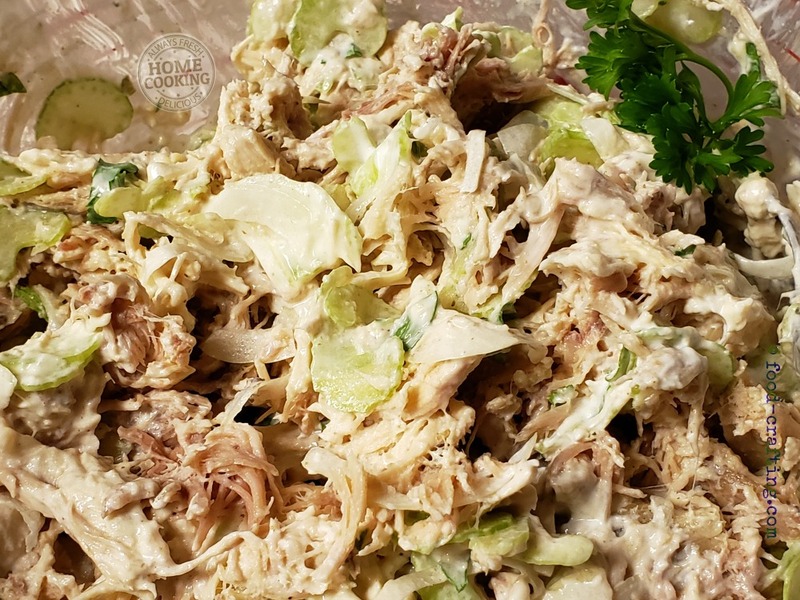 This chicken salad – and her old fashioned potato salad with cooked dressing – were so popular back then that those customers who were lucky enough to taste it still talk about it! Go ahead and pin the recipe right away. 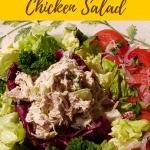 I never made cooked dressing for either the potato or chicken salad but here is a link to Margaret’s cooked dressing and mayo recipes from Farmer’s Market days. The chicken was not shredded. It was cut with a knife but it was cooked in the Instant Pot® instead of poached on the stove top. The texture of the chicken was no doubt somewhat altered by the cooking process. Very tender chicken meat will shred when combined with other ingredients such as mayo and sour cream. My thought is that Margaret probably used all white meat versus my combination of breasts and thighs (I cooked the chicken for this recipe as part of a meal prep cooking session – to include chicken salad). Using all white meat for the chicken salad is an easy option but after speaking to my sister-in-law, Margaret used both white and dark meat! No cooked dressing for me. 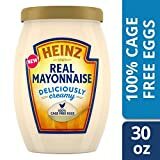 Just mayonnaise made with 100% cage free eggs, vinegar and lemon juice. That’s about as close to homemade mayo as it gets these days. Love the wide mouth jar! How many times have you reached into the mayo jar only to find that the spoon did not fit? No more. Getting the celery and onion cut to a paper thin size requires a mandoline – hand held or larger. Why get the big one out when the hand held does the trick. Just watch your fingers. If you are like me, I forget about the food holder. NoCry Cut Resistant Gloves – High Performance Level 5 Protection, Food Grade. Size Medium, Free Ebook Included! 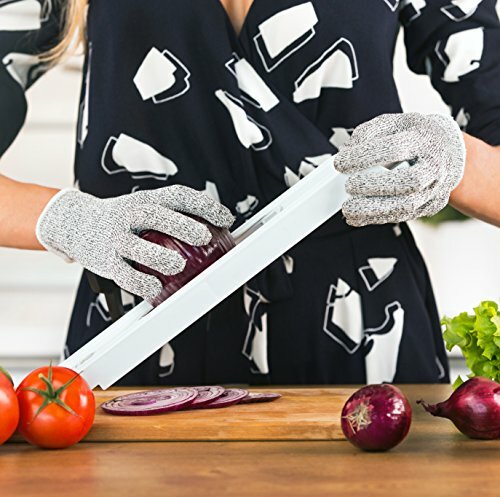 Wear cut resistant food grade gloves to cut the celery and onion. Place your thumb on the clear top portion of the mandoline. I do this because I want the distance between the blade and the top to remain even as I slice. Click on the image for detailed product information! You want paper thin slices of celery. Do the same for the onion. Using the slicer on setting #1 (1 mm), carefully slice 8 snack size celery sticks.I measured approximately 1 cup of sliced celery and about half as much sliced onion. Remember that the chicken was well seasoned during the cooking process but you may need to add salt. Prepare the salad ahead of time. It gives all the flavors time to combine. I prepared the chicken on Saturday for the sake of convenience. It was part of a chicken meal prep cooking session. Of course, the meat was cold when I cut it and added the seasonings. If you prepare the chicken on the same day to make a salad for dinner be sure to add the dry seasonings while the meat is still warm. Do not add the mayo or the sour cream until completely cooled then refrigerate immediately. As you can see from the image above, everything is dumped into the Prepware bowl. I do not stand on ceremony when cooking and preparing a recipe. Rarely do I measure and if I can make it easier, I nearly always do. In this case, it was perfect for preparing, refrigerating and transporting. No Pickles, No Hard Boiled Eggs and Definitely No Apples! I’m not one for adding ingredients where I feel they will lead the taste buds astray. 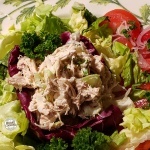 However, everyone has a favorite recipe for homemade chicken salad and I am sure that it tastes perfect to them. Nothing says that hard boiled eggs, green and red pepper slices, apples slices and even pickles would not make a great relish tray to round out the meal. I can’t believe I just referred to it as a relish tray – that’s SO central Pennsylvania! My preference is to keep things simple to enjoy the full flavor of well seasoned chicken, the crunch of fresh celery and the bite of onion. About the only compromise I have made is to add the celery seed. Why? Because it makes a world of difference to the overall taste of the chicken salad. It’s the secret ingredient in Margaret’s salad that has everyone asking “what did you add to the salad”? There’s only one other finishing touch I make. When adjusting the seasonings and I think it needs a wee bit more salt, I finish off each serving with a very light sprinkle of celery salt. 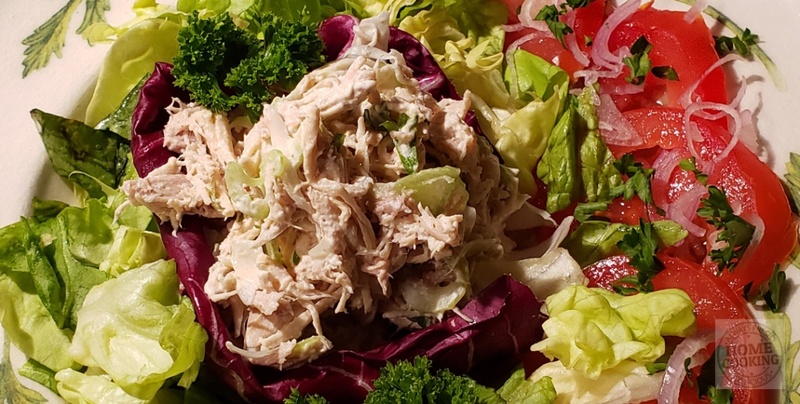 My mother-in-law’s famous (thanks to an unusual ingredient) old fashioned chicken salad from her Farmer’s Market days. Easy to make with a minimum of fuss. In this clan, it’s the only way we make chicken salad. 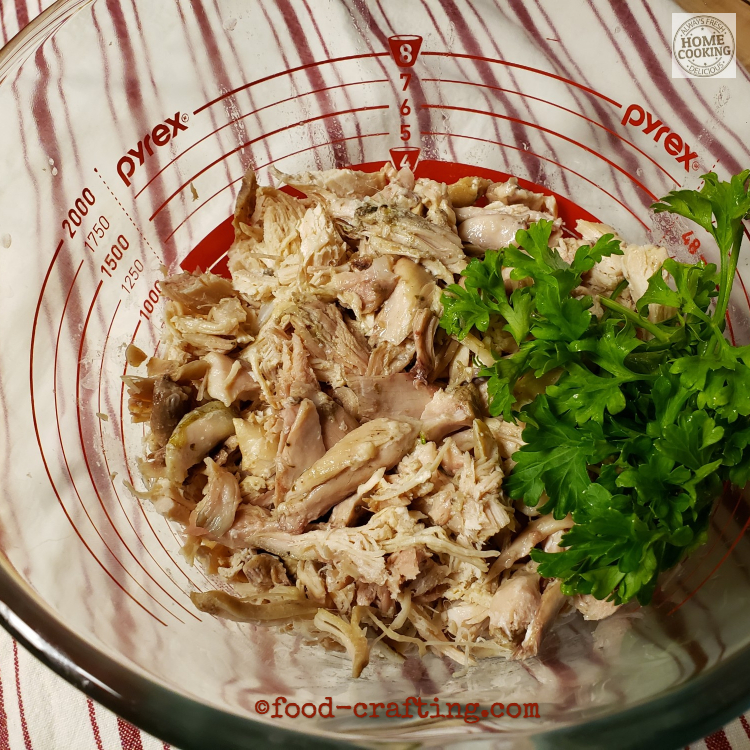 Cut the chicken into small bite size pieces directly into the Pyrex® bowl. You want about 4 cups of meat. Add the sliced celery, the sliced onion and the chopped parsley. Top with the celery seed. 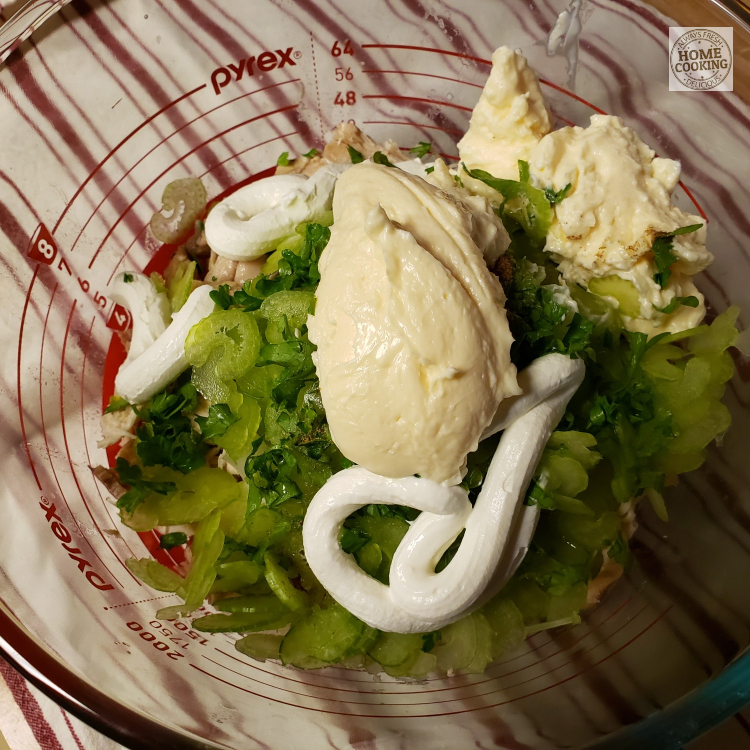 Add the sour cream and some mayonnaise. Mix well to combine the ingredients evenly throughout the chicken. Adjust the amount of mayonnaise and maybe the salt. You might want to sprinkle with celery salt later. Do not pack down into the container. Serve on a bed of lettuce. I used butter lettuce and radicchio as well as a side of sliced tomatoes topped with thin shallots and a drizzle of robust olive oil. Add a slide of thick cut French fries or cut some thick slices of baguette to serve with good butter. That’s all there is to it! 1.3 No Pickles, No Hard Boiled Eggs and Definitely No Apples!